One material that has emerged as a solution to hand dryer’s drip-problem is ceramic plating. Ceramic — not to be confused with glazed tile or porcelain — provides a porous surface that can absorb water. 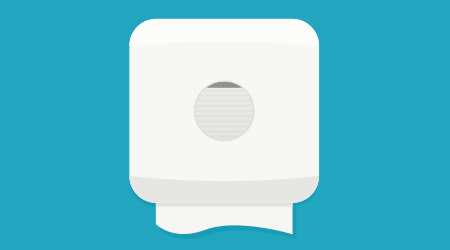 Currently, it is being used in wall guards, as well as featured in a few hand dryer unit designs. Over the past few years, vertical hand dryer units have gained more popularity. These hand dryers stand to solve the water problem by having users place their hands into the unit. Any water that cascades off a user’s hands flows into a reservoir built-in to the device, which can later be emptied for reuse. “Water that drips down is collected in the reservoir, eliminating the pooling on the floor,” Storto says. Some of these units feature LED displays that indicate when a water reservoir needs to be emptied. Others are additionally coated in antimicrobial materials, which help reduce the growth of harmful bacteria and fungus due to moisture. Hand dryer manufacturers say it is important for jan/san distributors to consider the type of facility, frequency of use, and a hand dryer’s location before settling on a product that can best handle hand drying and water-drip issues. After all, no one hand dryer design fits every facility need. Distributors can help their customers make the best choice and keep hands — and floors — dry.